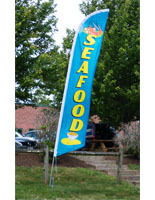 This pizza restaurant blade flag is a 14-foot outdoor rated fabric banner pre-printed in a stock design that will attract customers. 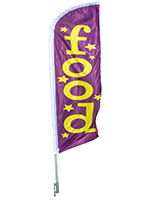 Each high visibility fixture comes with a feather-style full color display, a sturdy aluminum pole, and a ground-spike base for stability. 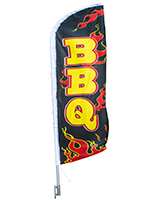 This tri-color restaurant blade flag for pizzerias, Italian restaurants, and specialty food vendors includes black text, a food graphic, and red-white-and-green printed polyester material that offers high visibility in either direction due to the bright through-print image. 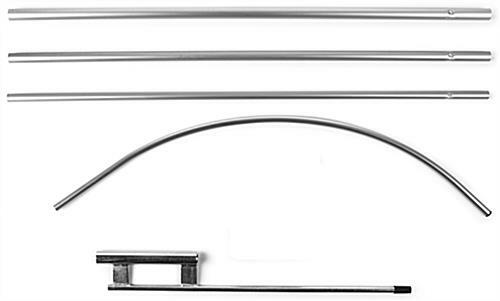 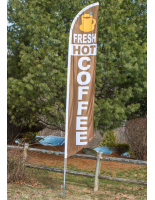 This 14' tall advertising display's sectional base post is easy to assemble and designed to provide customers with a clear view of the imprinted graphics. 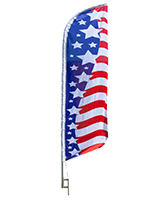 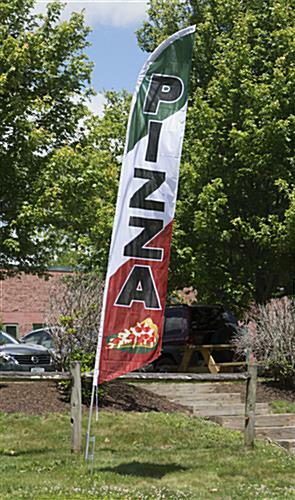 This tri-color outdoor pizzeria blade flag with bold text and graphics is designed to attract customers from distance. 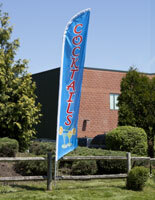 The red, green, and white Italian color scheme provides additional visual recognition in busy outdoor environments.